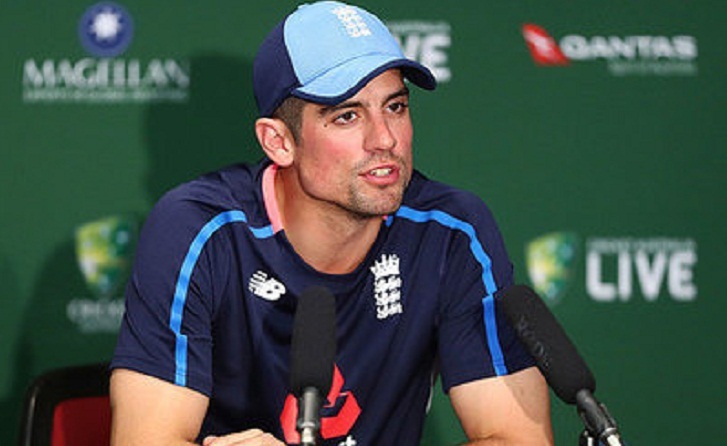 Alastair Cook dismissed talk of Mitchell Johnson as "irrelevant" on Tuesday as England prepare to face Australia's new-look pace attack in the first Ashes Test. The former England skipper and opening stalwart was speaking after Australia spinner Nathan Lyon's taunts that his team was in the mood to "end some careers" in the Brisbane Test. Much has been said about the demoralising effect Johnson, who is now retired from internationals, had on England at the Gabba four years ago, when he ripped through the tourists' batting. The firebrand left-armer set the tone for the 2013-2014 Ashes with his ferocious fast bowling to take nine wickets at the Gabba as the Australians inflicted a crushing 381-run defeat, triggering a 5-0 series rout. But Cook urged his team-mates to maintain their focus on the first Test and not to take a rear-vision view of past events. "Mitch bowled outstandingly in that series, one of the best periods of bowling I've ever faced backed up by Ryan Harris, Peter Siddle -- (but) they're no longer playing," Cook told reporters on Tuesday. "So in one sense it's a bit irrelevant. "It happened four years ago and it's all what happens on Thursday rather than looking back. "England have won four of the last five Ashes series, so you can look at what you want." Cook said while Australia's current pace attack -- Mitchell Starc, Josh Hazlewood and Pat Cummins -- was strong, it didn't hold any great fears for the tourists. "There's nothing we haven't seen before in cricket," he said. "They're not suddenly bowling 150 miles an hour. (They've) not got magic balls which start way outside the stumps and swing miles and stuff. "They're very good bowlers with good records. As batters, that is the challenge we've got in the next seven weeks." Australia have a formidable record at Brisbane's intimidating 'Gabbatoir' where they have not lost a Test match since 1988, and where England are winless in 31 years. Cook said England had "pretty much accepted" that star all-rounder Ben Stokes would not play a role in the Ashes series, despite reports that he may soon join the tour. The England and Wales Cricket Board (ECB) is still waiting to discover if Stokes will be charged by prosecutors investigating a brawl outside a nightclub in September. "Since we've arrived here, as a side, we've pretty much accepted Ben would not be here. It's about dealing with that," Cook said. "If there is a bonus of him making the trip at some stage, that'd be great. "But I can honestly say it hasn't been spoken about in the change room. "There's no good for us to really talk about that. It's obviously a sad situation... it's a shame for him he's missing a big series." Australian opener David Warner said Tuesday he wanted Stokes to be involved, but added: "I think it's probably disappointing for the England team and the country. He's let a lot of people down."